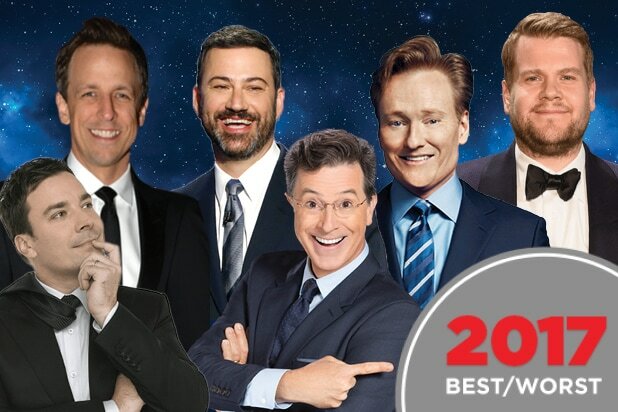 Note to all late-night hosts: If you have Sean Penn booked on your show, you should take a cue from Stephen Colbert and have an ashtray at the ready. The actor stopped by “The Late Show” on Monday to promote his new book, and he warned Colbert he was still a bit dazed after taking an Ambien following his red-eye flight the night before. So, naturally, he decided to smoke his way through the 10-minute sitdown. Toward the end of this interview, Colbert said he’d really prefer if Penn quit smoking, since he wants him to be around for a long time. The actor noted his habit ensured “job security for oncologists.” Well he’s not wrong there. "Jimmy Kimmel Live": Jimmy Kimmel Reveals Details of His Son’s Birth & Heart Disease -- The monologue the host gave just a few days after his son Billy was born may have been one of the most powerful openers in the history of late-night TV. Kimmel addressed his newborn baby's heart disease and called for health care reform in a clip that has been trending ever since. "The Late Late Show with James Corden": Harry Styles "Carpool Karaoke" -- The only thing better than regular "Carpool Karaoke" is "Carpool Karaoke" featuring another British guy who is just as quirky and adorable as James Corden. "Jimmy Kimmel Live": Guest Host Jennifer Lawrence Interviews Kim Kardashian West -- J. Law took over hosting duties for Jimmy Kimmel and used the opportunity to do an 18-minute interview with her favorite person in the world: Kim Kardashian West. "Late Show with Stephen Colbert": Andy Serkis Becomes Gollum To Read Trump's Tweets -- Colbert was right, they do sound better that way. "Tonight Show Starring Jimmy Fallon": Millie Bobby Brown Raps a "Stranger Things" Season 1 recap -- Yes, Eleven can rap. And yes, this may have been all you needed to prepare you for "Stranger Things 2." "Late Night with Seth Meyers": Trump, "Alternative Facts" and the Women's March: A Closer Look -- Remember when Kellyanne Conway taught us what "alternative facts" were? Seth Meyers' take on Conway's bizarre term was one of the best. "Late Show with Stephen Colbert": This Monologue Goes Out to You, Mr. President -- "Face the Nation"s John Dickerson took President Trump's insults in stride during their sit down at the White House. Stephen Colbert did him the courtesy of saying everything Dickerson had the willpower to keep inside. "The Late Late Show with James Corden": Spill Your Guts or Fill Your Guts with Khloe Kardashian -- Getting a member of the Kardashian clan to talk about themselves isn't hard. But making them answer deeply personal questions is another story, unless the alternative is eating something truly disgusting. "Late Night with Seth Meyers": Trump's Response to Charlottesville: A Closer Look -- Addressing the events of the neo-Nazi rally over the summer was no joke for late night, and Meyers used his platform to call out Trump for his response (or lack thereof) to the violence. "Conan": Bill Skarsgård's Demonic “IT" Smile -- We get it, Skarsgård. You are really scary. "Tonight Show Starring Jimmy Fallon": Miley Cyrus Busks in NYC Subway in Disguise -- Miley Cyrus and Jimmy Fallon are legit best friends, so it's getting harder and harder for him to outdo the last fun thing they did when she turns up on his show. But dressing up to perform in the subway incognito? Yeah, that'll do it. "Conan": Conan Works Out with Wonder Woman Gal Gadot -- Conan O'Brien tries to prove he's just as tough as Wonder Woman. Spoiler alert: He's not. 2017 was definitely a great year for late-night TV, so it's going to be pretty tough for 2018 to fill its shoes. Then again, we think we said that about 2016.